I’m writing this post on a bus somewhere in Tanzania, making my way from Kigali to Dar es Salaam, the coastal city where three friends from college are currently vacationing to visit another Yale friend who lives there. When I booked my April 9th bus ticket to Dar and Tuesday’s plane ticket to Johannesburg to visit another friend, I was joining the exodus of ex-pats who leave Rwanda during this somber time of genocide commemoration and take advantage of closed offices to travel. It seemed rude to arrange meeting with change agents, and especially to ask our co-workers to translate, while they memorialized lost loved ones. The president of Global Grassroots warned April was a difficult time to be in Rwanda and agreed it was a good idea for us leave the country. But as I’m watching the scenery change from Rwanda’s lush green to Tanzania’s yellow-brown, I don’t feel very excited to go travel. On Wednesday night, April 6th, as I came home from a friend’s house, the streets felt eerie. Seventeen years before on that very night, checkpoints had been erected on those very streets. Anyone who tried to pass was stopped and their identity card demanded. If the ethnicity read Tutsi, they were killed, raped, or maimed by machete. An extremist Hutu militia group called the Interhamwe organized an efficient system to exterminate all the Tutsi minority. They came frighteningly close: 800,000 Tutsi were killed, which was five out of six. My co-worker recommended that Christina and I attend the commemorative activities at the National Amahoro (Peace) Stadium the morning of April 7th, regarded the first of 100 days of genocide. We arrived with our friend Stephen at 8, and he waited in his long security line, which had about ten men for every one woman in ours. We sat through an hour of sound checks before Rwandans filled the rows and the 9:00 documentary aired. Made by Rwandans, it showed four women giving their testimonies: one was raped repeatedly and contracted HIV; another lost all of her children and family; another lost her beloved husband and twin sister, but survived along with 17 children by hiding among corpses; I can’t remember the story of the fourth, but I think three is more than enough. 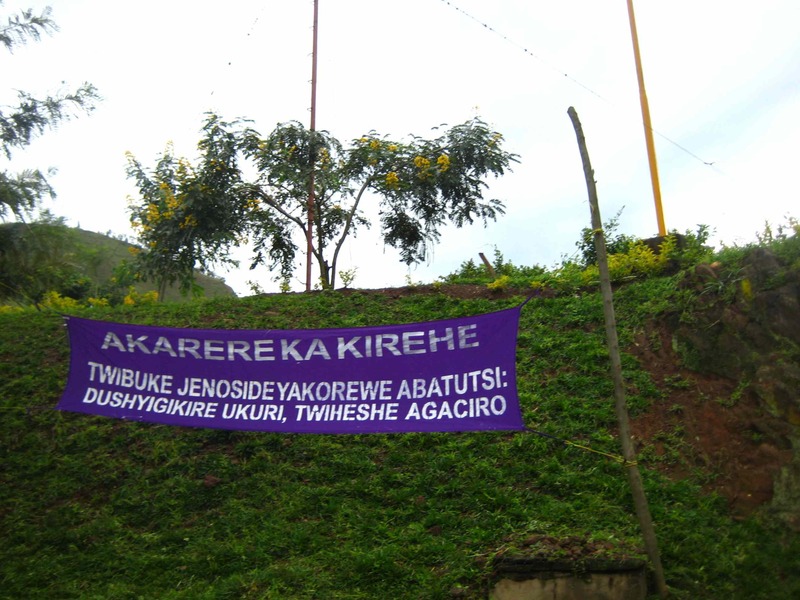 All around Rwanda purple banners hang, proclaiming “Remember the Genocide” or “Uphold the Truth. Preserve our Dignity.” That was the theme of President Kagame’s speech, too. Before the president spoke at noon, a man sang a song in Kinyarwanda. In the middle of the song, shouts rang outside the stadium. It sounded like the person was shrieking in pain. I feared there had been some sort of violence by the genocide deniers (exiled Hutu extremists called the FDLR who oppose the current government, led by Tutsi Paul Kagame). The shrieks continued for about a minute, then subsided. The song continued uninterrupted until someone shrieked again, but this time from inside the stadium. Everyone looked across the field from my section where police and volunteer staff in white shirts and purple kerchiefs were running up the stairs and parting the people (there are no aisles). They stopped at a wailing woman, the source of the sound. It reverberated around the whole stadium and the noise carried so clearly. We all watched as they picked her up, still shrieking, and carried her– on her back with her arms and legs in the air– down through the crowd and out to the stadium exterior until the sound finally subsided. But before she was out more wails began, this time to my left under the big screen. Her shrieks blended in with the other woman’s and they echoed and echoed across the whole stadium, competing with the music. She too was carried out, on her back. It continued through the song and escalated during the following performance of slow, expressive dancing to beautiful, penetrating music. One woman would shriek, and it would grow louder and more hysteric until the volunteers or police came to assist her, carrying her out as her limbs flailed, sometimes grabbing people and clawing at the uniform of police. There would be another. Then a short reprieve, and then another and another and another until the entire stadium was just filled with wailing and its echoing. It was naked pain. Most people around us were weeping, and the boy next to me was sobbing silently, shaking. I didn’t know what to do, so I slipped him some tissues. A girl six seats over in the row behind me was crying and crying while her friend rubbed her back. Stephen and I had tears, too, while all around volunteers rushed to carry people out as they shrieked and their limbs flailed. The girl behind us had been sobbing quietly for about twenty minutes before it escalated, becoming harder and louder and more inconsolable. Eventually they came to her and she seemed to be thrashing to resist the uniformed man who was carrying everyone out in our section— around ten people total. There were more than twenty sections. When we left, the grass ringing the stadium was lined with people recovering from their trauma. I heard shrieking and saw someone being carried in front of us and realized he was a man… so it hadn’t been all women. Men could make those high-pitched noises too, and it sounded terrible. His arm was rigid, reaching out, and he was crying, crying, crying. My friend didn’t go to the stadium. She was orphaned in the genocide and preferred to spend the day at home with her family. With a purple shawl draped over her, she welcomed me that evening. We hung out, talked, drank tea and ate some dinner, looked at wedding pictures and told a few funny stories. She seemed to be weathering the day well, but then again, she raised her three sisters, found herself a good job and is raising a beautiful daughter while her soldier husband is away– she weathers everything well. We were relaxed in one another’s company and talked and flipped through photos. When my eyes drooped, she told me I should sleep in the extra bed while her sister and her friend, who was also orphaned, shared another bed. In the morning we played with her daughter and talked about the genocide and its legacy. It was almost noon and she told me I should stay for lunch, but I thought I should probably go pack for my trip. I wish I could’ve stayed. I texted my other close friend who lost her mother, hoping to pay her a visit, but she didn’t respond. I respected her privacy and hurried about packing for my 5 am bus. Before I knew it, it was too late to call the other people to whom I had intended to express sympathy. As I crossed the border into Tanzania at 8:00 am Saturday, I simultaneously received a text that my message to my friend hadn’t gone through, and a text from the other woman thanking me for the night together and my support. The stamp pounded my passport and I swallowed hard. Whenever you meet an ex-pat here, you ask each other how long you’ve been in Rwanda, and sometimes it feels competitive. We all round up– “almost six months,” “just about a year”– never wanting to seem like what some Rwandans call us, “the foreigners who come and never stay.” That phrase was tossed around often after the genocide when all foreigners were evacuated. I’m incredibly fortunate to be traveling to places like Tanzania, South Africa and Mozambique, but I wonder if there wasn’t a better time. I knew I wouldn’t be able to work, but I didn’t know there would be other things to do. I'm updating this post with a photo I took recently of a billboard in town, sponsored by BCR bank. 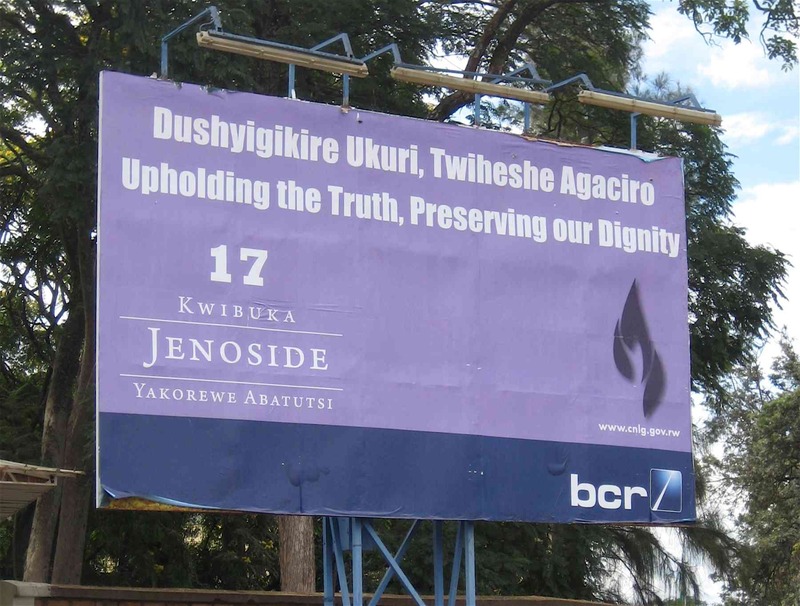 During these 100 days, the national (and only) TV station RwandaTV broadcasts the flame seen on this billboard, along with a small "17," in the upperleft corner of the screen during all its programming. This entry was posted on Tuesday, April 12, 2011 at 1:06 pm	and is filed under Uncategorized. You can follow any responses to this entry through the RSS 2.0 feed. Your blog post is outstanding! I could feel the despair of the keening men and women in the stadium. I enjoyed reading this, and will be back to see updates. I’m not sure how I got here, I was working on an assignment for my Women’s Studies Leadership class and a search actually got me here. Awesome writing. I look forward to more descriptions of your journey.